Location — Verkhny Tagil, Sverdlovsk Region. 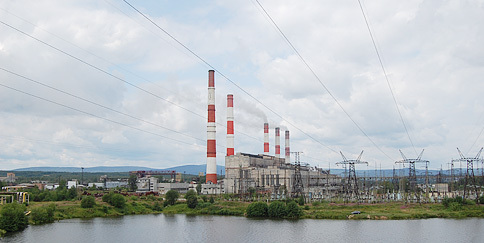 Verkhny Tagilskaya TPP is a major supplier of electricity in Sverdlovsk Region. Besides natural gas, it uses coal as its main fuel and fuel oil as backup fuel. Verkhnetagilskaya TPP has 1,497 MW of installed capacity comprising four 88 MW T-88/100-90/2,5 turbines; two 100 MW K-100-90 turbines; two 165 MW K-165-130 power generating units; and three 205 MW K-205-130 power generating units. Construction of Verkhnetagilskaya TPP began in 1951. The first power generating unit was launched in 1955. In 1964, the station reached its planned capacity of 1600 MW. Four condensing turbines were eventually upgraded to heat turbines according to HF CKB design in order to improve delivery of heat to Verkhny Tagil and Novouralsk. 4th stage generating units were renamed to K-165-130 after they were refitted to use Ekibastuz coal. Since June 2005, Verkhnetagilskaya TPP is a subsidiary of OGK-1.